I was first introduced to the wonderful Ronni Lundy in 2010, when she asked my friend Lora and me to contribute a piece on Pi(e) Day to her online food magazine Zenchilada (if you're not familiar with Ronni's books, editorial work, and contributions to the Southern Foodways Alliance, school yourself!). But I didn't actually meet her in person until this May, when, covered in flour, we whirled about the Jackson County, Kentucky community kitchen, jabbering and singing Dwight Yoakam songs as we made deviled eggs, sweet potato sonker, rhubarb tarts, cake, cocktails, and more for a farm party and feature in her upcoming book on Appalachian foodways. We instantly connected-- so much so that when I realized that I'd remembered my Kitchen-Aid mixer but entirely forgot the attachments, she asked me if I was sure I wasn't her long-lost child. I learned a lot from Ronni from just those few hours in the kitchen, but she's been a teacher and inspiration ever since that first e-introduction. One of the biggest lessons I've gleaned from her is through her dedication to the sweet, complex syrup beloved in the Appalachian South-- sorghum. 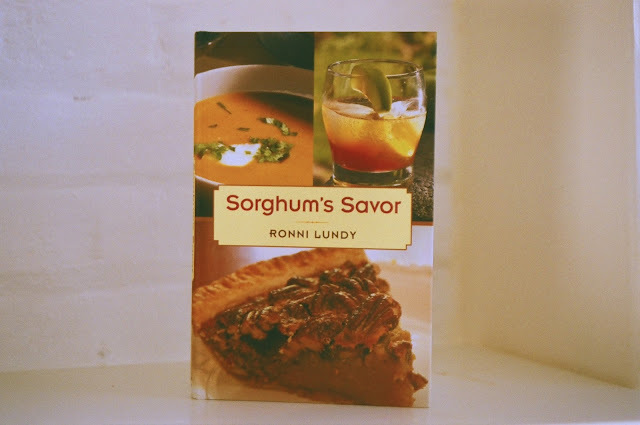 Ronni champions the ingredient in many forums, but she published a book on the stuff, Sorghum's Savor, earlier this year. It's part reference-part cookbook, with personal essays and historical background, testimonies from chefs and favorite folk musicians (Jean Ritchie, namely) and recipes from Ronni and other notables like Edward Lee, Travis Milton, Nancie McDermott, Sean Brock, John Fleer, and Anna Bogle. It's full of information and wit and appetite-inspiring recipes-- the type of cookbook that you want to read cover to cover. If I lost you on "sorghum," I suggest you allow yourself the full introduction via Ronni's book and a few jars of the stuff, but here's what you need to know: Sorghum is a grass that resembles corn and similarly can be processed to produce grain. Sweet sorghum varieties, however, can be crushed and processed to produce a molasses-like syrup. In the mountain South and parts of the Midwest, where it's been grown for sweetener since 1850, sorghum syrup is often referred to as "molasses," "sorghum molassses" or by some very old-timers, "sugar cane." 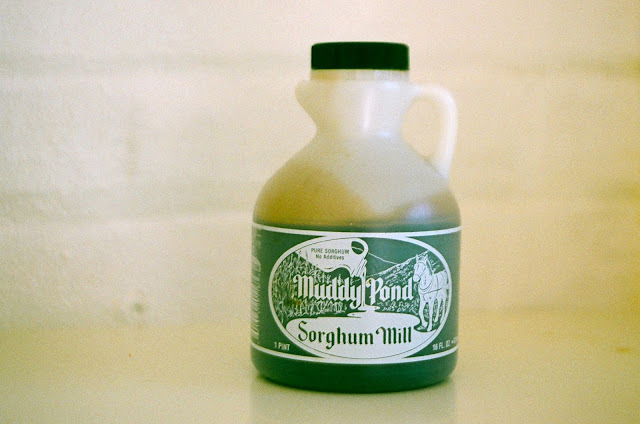 If an Appalachian or Midwestern rural recipe from that era calls for "molasses" it's likely that sorghum syrup was what was actually used, as it was readily available and affordable for farm and mountain families. Though in mainstream contexts, sorghum fell out of favor with the boom of the industrial food system, it has persisted in mountain communities and is now making a comeback with increased interest in traditional, regional foodways. It's a dream ingredient-- sweet but not saccharine nor as bitter as molasses, with a complex savory flavor that varies depending on provenance and process-- a distinct terroir. I've been baking with it for a while now, and was beyond delighted when Ronni asked me to contribute a dessert to Sorghum's Savor. I liked the idea of doing a pandowdy--essentially a cobbler differentiated by the use of "molasses" as a sweetener and the spooning of filling over the biscuits at the end of the baking time. 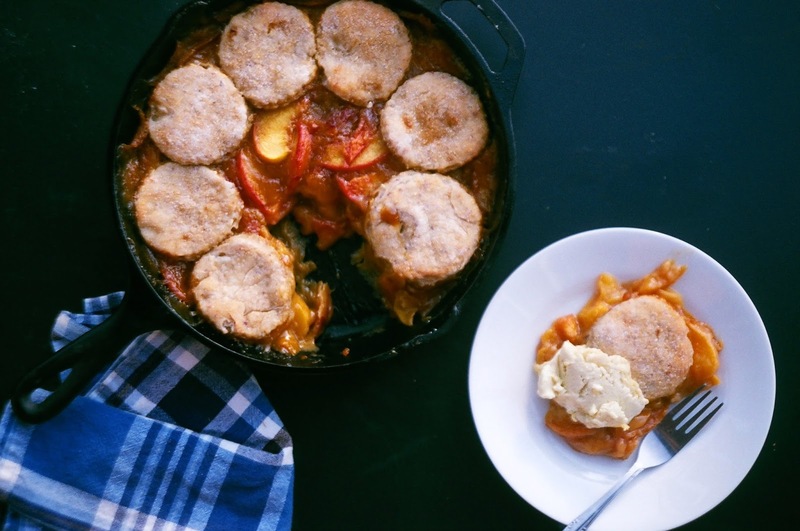 Fresh peaches and cornmeal biscuits complete the trifecta with sorghum for a hearty summer dessert, which Ronni calls, "Emily's Howdy Pandowdy with Cornmeal Biscuit Top." I recommend enjoying it with a big scoop of homemade vanilla custard. 1. In a medium bowl, whisk together flour, cornmeal, sugar, baking powder, and salt. With a knife and fork or pastry cutter, cut in the butter until mixture resembles the consistency of cornmeal and peas. Add cream and stir gently to combine. 2. Form dough into a ball and cover with plastic wrap. Store in the fridge for at least 20 minutes while you prepare the filling. 3. 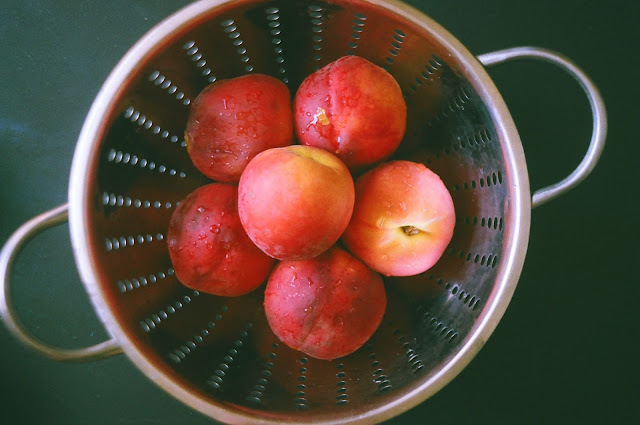 Preheat oven to 375 degrees F. Lightly grease and flour the inside of a 9-inch cast-iron skillet, or if that is unavailable, a deep casserole dish of similar size. 4. In a medium bowl, combine peaches, lemon juice, flour, and sorghum. Stir in the ginger as well as the salt. Pour filling into the prepared skillet. Cover top with foil and bake for 25 minutes. 5. While filling is baking, roll out chilled biscuit dough on a clean, floured surface into a 9-to-10-inch circle. Cut 6 to 8 rounds with a biscuit cutter and set aside. 6. 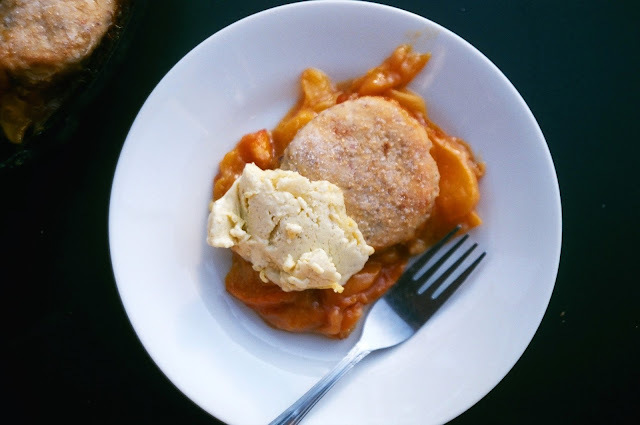 Once filling has baked, remove from oven, and arrange cut biscuits evenly over the filling. Sprinkle with Turbinado sugar. Return to the oven and bake for 20-25 minutes more, until biscuit dough is light golden and filling is bubbling. 7. Remove from the oven and spoon some of the steaming filling over the biscuit top (this little move is a defining characteristic of a pandowdy, along with the use of molasses or sorghum in the filling!). Return to the oven to bake for 5-10 minutes more. Remove from oven and let cool. Serve slightly warm with a scoop of homemade vanilla custard. 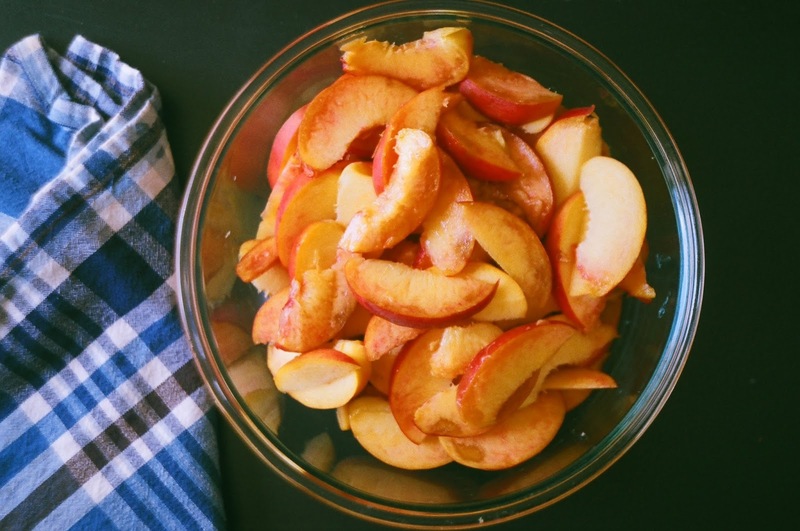 Thanks to Food52 for featuring this post in 8 Food Blog Links We Love! Labels: cast iron skillet, film, Kentucky, pandowdy, peach cobbler, Peach-Sorghum Pandowdy with Cornmeal Biscuits, Ronni Lundy, sorghum, Sorghum's Savor, Washington D.C.
Really liked getting some background on Sorghum! I've heard it being used but I was always a little shy to ask about what it was. Thanks for sharing Emily! Now when anyone mentions Sorghum, I'll know! =) PS: Those peaches and those biscuits!! Glad to hear it, Gabriel! This was terrific, I had sorghum in the frig and was delighted to try this recipe --- the local grocer has had organic peaches for a few weeks that are beautifully ripe. I made it for an impromptu dinner party tonight where the host had made peach-banana ice cream which we enjoyed with the Pandowdy. Thanks!